Obama warns Putin not to move on Ukraine. Will the Russian Czar listen? “Obama called on Russia to respect the independence and territory of Ukraine and not try to take advantage of its neighbor, which is undergoing political upheaval,” AP noted. “Any violation of Ukraine’s sovereignty and territorial integrity would be deeply destabilizing,” Obama said in a statement delivered from the White House. Such action by Russia would not serve the interests of the Ukrainian people, Russia or Europe, Obama said, and would represent a “profound interference” in matters he said must be decided by the Ukrainian people. I’ll be blogging & Tweeting from AIPAC this weekend. Netanyahu, Kerry to speak. Here are details of the event. (Washington, D.C.) — I’ll be attending the AIPAC Policy Conference in Washington this weekend (March 2-4), and will blog and Tweet from the world’s largest annual gathering of pro-Israel activists. It’s been several years since I’ve attended the full conference, and not just the Gala on Monday night. But given the enormous strains between the U.S. and Israel, and the high stakes of what’s ahead in 2014 and 2015, I felt this year I should attend to try to better understand the mood of the American Jewish community, and hear first-hand the keynote speeches as well as the numerous break-out sessions with top policy experts. Prime Minister Netanyahu is coming from Israel to address the expected audience of some 14,000 people. Secretary of State John Kerry will represent the Obama administration. Producers of “Son of God” film reached out to Jewish leaders to “make sure we told this movie sensitively.” Film launches nationwide today. ( Washington, D.C.) — Today, the motion picture “Son of God” opens in 3,000 theaters nationwide. It is a powerful drama and highly controversial, and it may prove to be the most important film of the year. My family and I are looking forward to seeing it this weekend. I hope that you’ll take your family as well, whether you’re Jewish or Gentile and regardless of your spiritual or religious background. Unfortunately, it has not always been told well. The Gospel-writers and the Apostle Paul told it best, of course, because they lived it, first hand. Read a sobering yet fascinating article this morning about the magnitude of Christian persecution in our age. It was written by George Weigel, the distinguished senior fellow of Washington’s Ethics and Public Policy Center. Weigel is Catholic and writes from this vantage point in an on-line magazine called, First Things. Regardless of whether you’re Catholic or Protestant, however, it is worth noting what Weigel is saying, especially in light of Christ’s warning in Matthew 24 that persecution will increase in the last days before His return. Let us be praying faithfully for persecuted Christians in the Middle East, and around the world. We have been living, and we’re living now, in the greatest era of persecution in Christian history. More Christians died for the faith in the twentieth century than in the previous nineteen centuries of Christian history combined. Is Russia preparing to move on Ukraine? Sends fighter jets, troops near border. U.S. warns Russia military force would be “grave mistake.” Here are the latest developments. 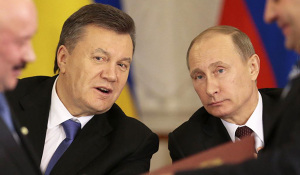 ( Washington, D.C.) — Is Vladimir Putin preparing Russian forces to move against Ukraine? I pray not, but at the moment, there are mixed signals, and U.S. and Ukrainian officials are clearly worried and warning Russia not to intervene. Russia Warns Of “Dangerous” Dilemma In Ukraine — “Forcing Ukraine to choose between close ties with Russia or the West is ‘dangerous,’ the Russian foreign minister has warned. Urging the European Union and the United States not to intervene in shaping the country’s future, Sergei Lavrov said: ‘It’s dangerous and counterproductive to try to force upon Ukraine a choice on the principle: “You are either with us or against us,”‘” reports Sky News in London. “Russian President Vladimir Putin put 150,000 Russian combat troops on high alert for war games Wednesday, rattling nerves in a neighboring Ukraine already consumed by upheaval,” reports NBC News. Authorize Force Now: Congress should deter Iran’s nuclear ambitions by authorizing, now, the president to use military action, two U.S. scholars say. Are they right? Two American professors wrote a column for National Review Online this week that bears close examination and careful consideration. Concerned that the Iran is getting dangerously close to building operational nuclear warheads, they argue that the President’s current round of diplomacy with Iran would be immeasurably strengthened if Congress now passed legislation authorizing the use of force to neutralize the Iranian nuclear threat if diplomacy fails. The two international legal scholars argue this is both sound policy, and a sound constitutional exercise of power. They make clear they don’t want war with Iran, if it can be avoided. But the believe it is time to send a strong message to Tehran, and they want Washington to be ready to act should Iran suddenly make a “dash” for The Bomb. I commend the following article to your attention…..
Putin puts 150,000 Russian troops on alert as Georgia moves to join NATO. ( Washington, D.C.) — With tensions high in Eastern Europe amidst the crisis in Ukraine, the government of Georgia is urgently seeking membership into the European Union and NATO, in part to defend itself against Russian imperialism. Now, Russian President Vladimir Putin has put 150,000 Russian troops on alert, conducting snap exercises and causing tensions in the region to spike even further. As you will recall, Russia invaded Georgiaand occupied parts of it in August of 2008. Georgian Prime Minister Irakli Garibashvili is currently in Washington. In a meeting with Vice President Biden yesterday, he received the White House blessingfor Georgia to become part of the European economic and security alliance. Who’s Master Plan Are You Following? The murderous act of abortion. mightymicky73 on Do you worship a sport? Elias Kanaris on Do you worship a sport?